IN François Ozon’s latest film, “Potiche”, Catherine Deneuve (pictured) plays a trophy wife, a potiche, who spends her days jogging in a scarlet jumpsuit, making breakfast for her cantankerous husband and writing poetry perched on a sofa. But then her husband, the boss of an umbrella factory, is taken hostage by striking workers. Ms Deneuve takes over the factory and charms the workers into returning to work. She jazzes up the products and generally proves that anything a man can do, a woman can do better. The film was set in 1977, when the only women in a typical Western boardroom were serving the coffee. Times have changed. These days no one doubts that women can run companies: think of Indra Nooyi at PepsiCo, Carol Bartz at Yahoo! or Ursula Burns at Xerox. Sheryl Sandberg, the number two at Facebook, is more widely applauded than her young male boss, Mark Zuckerberg. Yet the number of female bosses of large firms remains stubbornly small. Not a single one on France’s CAC 40 share index or on Germany’s DAX index is run by a woman. In America, only 15 chief executives of Fortune 500 companies are women. Britain does better, but not much: five of the FTSE-100 firms have female bosses. Several governments, especially in Europe, have decided that radical action is required to increase the number of women in the executive suite. Norway passed a law in 2003 that obliged all publicly listed firms to reserve 40% of the seats on their boards for women by 2008. Spain passed a similar law in 2007; France earlier this year. The Netherlands is working on one. On July 6th the European Parliament passed a resolution calling for EU-wide legislation stipulating that at least 40% of seats on listed companies’ supervisory boards will be reserved for women by 2020. This does not oblige member states to do anything, but it reflects a spreading mood. The German government is considering whether to impose quotas. America is not, but new rules from the Securities and Exchange Commission will require firms to reveal what, if anything, they are doing to increase diversity at the top table. Viviane Reding, the EU commissioner for justice, argues that compulsion is the only way to overcome entrenched discrimination. For a whole year she has tried to cajole companies to take voluntary measures to promote more women. In March, she posted a “Women on the Board Pledge for Europe” on her website. This allows companies to promise that women will make up 30% of their boards by 2015 and 40% by 2020. Only seven companies have signed up so far. Moët Hennessy Louis Vuitton (LVMH), a French luxury-goods maker, added itself rather ostentatiously on July 12th. But cynics doubt that this owed much to the commissioner’s powers of persuasion. LVMH was only pledging to do what the new French law already obliges it to. There is a powerful business case for hiring more women to run companies. They are more likely to understand the tastes and aspirations of the largest group of consumers in the world, namely women. They represent an underfished pool of talent. And there is evidence that companies with more women in top jobs perform better than those run by men only. McKinsey, a consultancy, recently looked at 89 listed companies in Europe with a very high proportion of women in senior management posts and compared their financial performance with the average for firms in the same industry. It found that these firms enjoyed a higher return on equity, fatter operating profits and a more buoyant share price. The authors described the correlation between promoting women and doing well as “striking”, though they admitted that they could not prove what was causing what. It is possible that firms that are already doing well tend to hire more female directors. Proponents of quotas cite the superior performance of firms with female directors as evidence that quotas will benefit companies and their shareholders. Sceptics doubt this. The women that companies voluntarily appoint to boards are mostly excellent (indeed, they may have had to be particularly talented to overcome the barriers in their way). The effect of quotas, however, will be to elevate women who would not otherwise get onto the board. It would be surprising if they proved as able as those appointed without such help. The evidence from Norway, the first European country to impose strict quotas, suggests that compulsion has been bad for business. Norwegian boards, which were 9% female in 2003, were ordered to become 40% female within five years. Many reached that target by window-dressing. The proportion of board members in Norway who are female is nearly three times greater than the proportion of executive directors (see chart). To obey the law, Norwegian firms promoted many women who were less experienced than the directors they had before. These new hires appear to have done a poor job. A study by Amy Dittmar and Kenneth Ahern of the Ross School of Business at the University of Michigan found that firms that were forced to increase the share of women on their boards by more than ten percentage points saw one measure of corporate value (the ratio of market capitalisation to the replacement value of assets, known as Tobin’s Q) fall by 18%. If quotas aren’t the answer, what is? The question is fiendishly complex. In most rich countries, women do as well as men or even better at school and university. In America, most new master’s degrees are awarded to women. Women also hold more than half of the entry-level jobs at American blue-chip companies. But corporate women start to fall behind their male peers right from the beginning. They are less aggressive than men when negotiating their first salary and every subsequent pay rise. Linda Babcock of Carnegie Mellon University found that her male graduate students secured starting salaries 7.6% higher than her female graduate students. In general, men are four times more likely to ask for a pay rise than women are. Compounded over time, this makes a huge difference. The higher you gaze up the corporate ladder, the fewer women you see. According to Catalyst, a researcher in New York, women are 37% of the middle managers in big American firms, 28% of the senior managers and a mere 14% of executive-committee members. Is discrimination to blame? While firms that discriminate a lot will be eclipsed by those that promote on merit (and possibly sued), that can take time. And men do persistently underestimate women, argues Herminia Ibarra of INSEAD, a business school in France. Ms Ibarra looked at more than 20,000 assessments of INSEAD’s executive students. The men on the faculty judged the women to be just as capable as the men (or more so) in most areas, but thought that they lacked strategic vision. No such lack was seen when their female colleagues judged the students. The way patronage and promotion work within the corporate world may count against women. Nearly all the executives who rise to the top have had a powerful backer, according to Sylvia Ann Hewlett, the author of “The Sponsor Effect”, a report for theHarvard Business Review. Yet women often fail to cultivate what Ms Hewlett calls “relationship capital”. They hesitate to call in favours for fear of seeming pushy. And many are afraid of the gossip that a close relationship with a senior male colleague might provoke. No doubt all of this plays its part. But a much bigger obstacle to putting more women in boardrooms is that so many struggle to balance work and a family. In all societies, at least for now, women shoulder most of the burden of looking after children and ageing parents. European women devote twice as much time as men to domestic tasks, according to McKinsey. It varies from country to country. Latin men are slacker than Nordics. Italian men spend only 1.3 hours a day on domestic chores, whereas Italian women spend 5.2 hours. In Sweden, the ratio is a somewhat fairer 2.3 hours to 3.4. Partly because it is so tricky to juggle kids and a career, many highly able women opt for jobs with predictable hours, such as human resources or accounting. They also gravitate towards fields where their skills are less likely to become obsolete if they take a career break, which is perhaps one reason why nearly two-thirds of new American law graduates are female but only 18% of engineers. A study by the Centre for Work-Life Policy, a think-tank based in New York, found that, in 2009, 31% of American women had taken a career break (for an average of 2.7 years) and 66% had switched to working part-time or flexible-time in order to balance work and family. Having left the fast track, many women find it hard to get back on. Some governments try hard to help women combine a career and family. 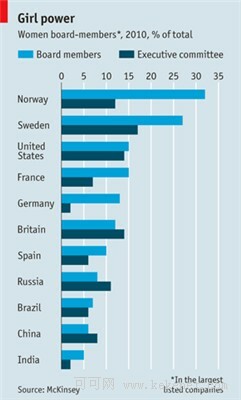 France and the Scandinavian countries help with child care. Crèches and nurseries are subsidised. State schools will hang on to the little monsters well into the evening. This contrasts starkly with American and British schools, which boot them out long before an adult’s work day is over. American parents must also square the circle of ultra-short holidays for grown-ups and absurdly long ones for kids. Now the labour minister, Ms von der Leyen is pushing hard for Germany to introduce Norwegian-style mandatory quotas for women in boardrooms. German companies are scared. Some are setting themselves voluntary targets in the hope of avoiding state coercion. Deutsche Telekom, a German media behemoth, has declared that 30% of its middle and upper management jobs will be filled by women by 2015. “We have tried mentoring, coaching and networks, but nothing worked,” says Anne Wenders, a spokeswoman for the company. Women made up 30% of Deutsche Telekom’s staff and 13% of the company’s top managers in Germany when the policy was introduced last year. These numbers have yet to budge. Still, following Deutsche Telekom’s example, all 30 companies in the DAX index recently agreed to set themselves similar goals. Women bring unique strengths to a company, reckons Lisa Gersh, the boss of Martha Stewart Living Omnimedia, a merchandising and media firm founded by a lifestyle guru. They are more collaborative than men, says Ms Gersh, and better at multitasking. Those with children quickly become efficient. They know that they have to be home at a certain time. Companies everywhere are trying to figure out ways to help employees juggle their work and family life. Technology should make this easier. Thanks to broadband internet, many tasks can be done from home. Nearly 20% of American employees telecommuted last year. Some female executives routinely take calls while outside the school gates. As the tussle for talent intensifies, such scenes will grow more common.